All three Suzuki World riders put themselves in good positions for tomorrow’s motos with Kevin Strijbos, Jeremy Seewer and Hunter Lawrence going fifth, fourth and 11th in their respective classes. After two days of solid rain, the MXGP of the Netherlands track at Assen was extremely wet in some places, but surprisingly dry in others. This gave all of the riders a really tough challenge, however the Suzuki riders acquitted themselves admirably and head into the races on Sunday with a good chance of challenging for the podium positions. Unfortunately, Arminas Jasikonis (hip) and Bas Vaessen (collarbone) are both injured and aren’t able to compete at a track that both of them would’ve been looking forward to. In their place though, Strijbos, Seewer and Lawrence are excited for the races at an Assen track which will hopefully be a lot drier than today. MXGP Qualifying Results: 1. Jeffrey Herlings (NED, KTM), 23:49.015; 2. Tim Gajser (SLO, Honda), +0:18.550; 3. Gautier Paulin (FRA, Husqvarna), +0:21.696; 4. Jeremy Van Horebeek (BEL, Yamaha), +0:23.957; 5. 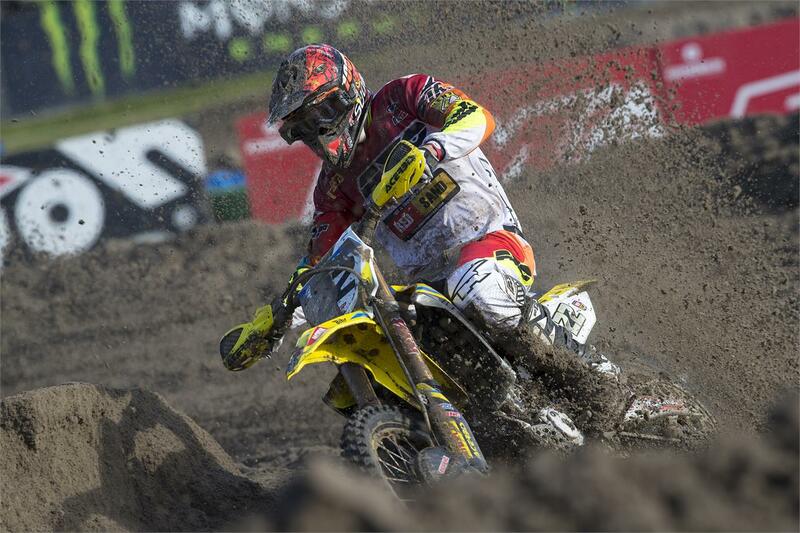 Kevin Strijbos (BEL, Suzuki World MXGP), +0:26.247; 6. Romain Febvre (FRA, Yamaha), +0:33.587; 7. Evgeny Bobryshev (RUS, Honda), +0:35.585; 8. Maximilian Nagl (GER, Husqvarna), +0:36.304; 9. Glenn Coldenhoff (NED, KTM), +0:40.188; 10. Antonio Cairoli (ITA, KTM), +0:53.744. MX2 Qualifying Results: 1. Thomas Covington (USA, Husqvarna), 25:22.519; 2. Thomas Kjer Olsen (DEN, Husqvarna), +0:03.320; 3. Conrad Mewse (GBR, Husqvarna), +0:06.858; 4. Jeremy Seewer (SUI, Suzuki World MX2), +0:12.819; 5. Calvin Vlaanderen (NED, KTM), +0:25.660; 6. Davy Pootjes (NED, KTM), +0:26.215; 7. Jorge Prado Garcia (ESP, KTM), +0:32.771; 8. Brian Bogers (NED, KTM), +0:33.524; 9. Julien Lieber (BEL, KTM), +0:10.478; 10. Ben Watson (GBR, KTM), +0:35.641; 11. Hunter Lawrence (AUS, Suzuki World MX2), +0:40.426.